I love the Vegan Junk Food Bar in Amsterdam! 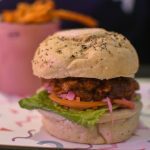 They opened up their first all vegan fast-food burgerbar in Amsterdam-West in 2017. It was a big succes straight away! 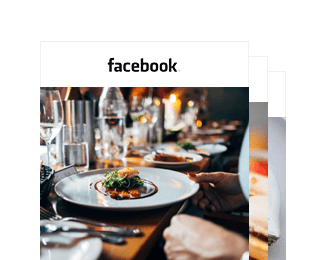 By popular demand they opened up a second restaurant at the Marie Heinekenplein in neighborhood De Pijp in October 2017 and a third restaurant in Amsterdam Oost (East) in Februari 2018. 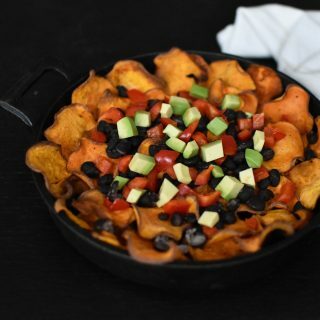 And last month the Vegan Junk Food Bar has opened up their fourth restaurant: VFJB Downtown. 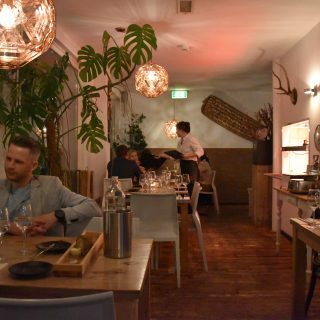 You can find the newest restaurant at the Regulierdwarsstraat, in the middle of the city center in one of the most popular (gay-friendly) streets for going out. 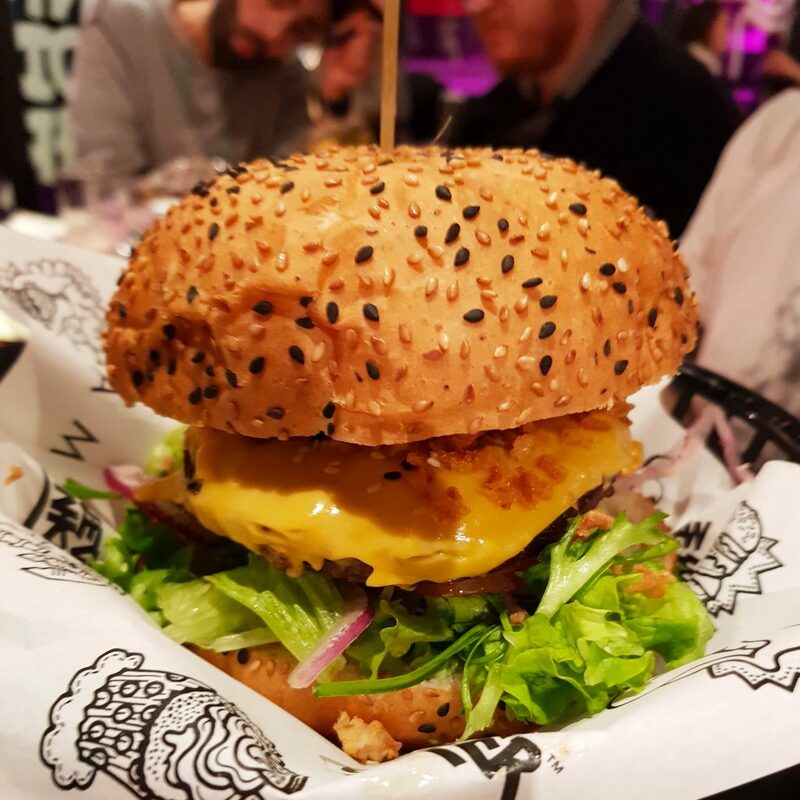 This makes this 4th Vegan Junk Food Bar in Amsterdam a perfect stop for a pre or post clubbing vegan burger. 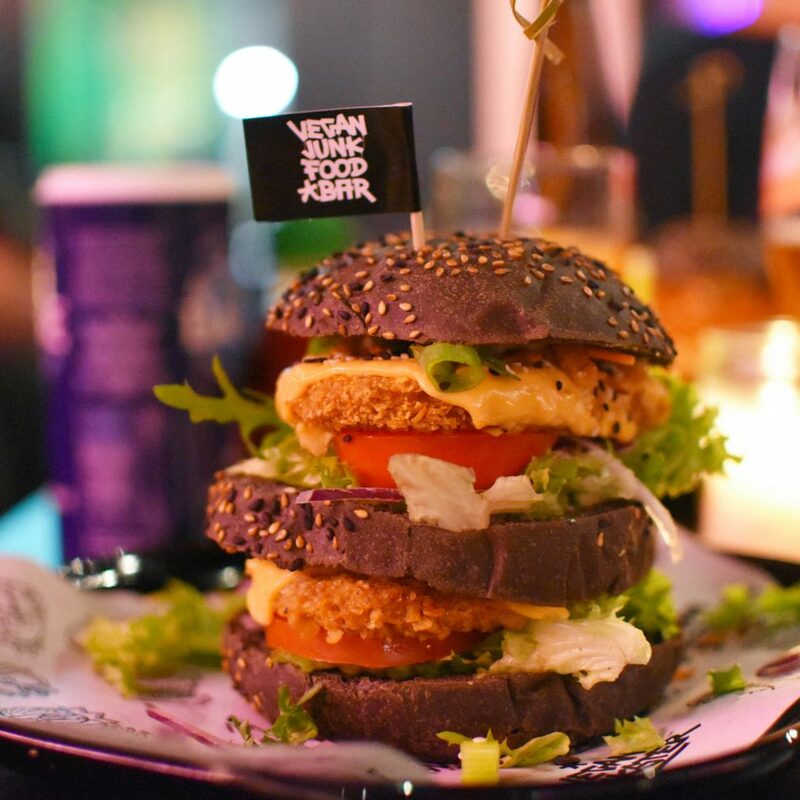 On the menu of the Vegan Junk Food Bar in Amsterdam you’ll find exactly that what you would expect: 100% plant-based fast food. 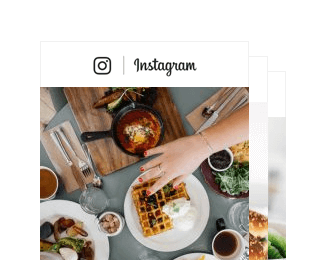 The most popular categories on the menu are their burgers and the loaded fries. 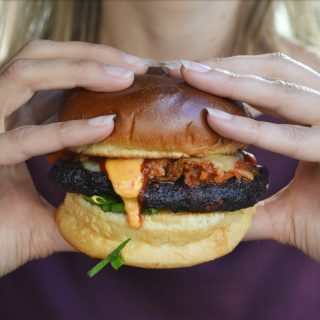 The burger pictured at the top of this page is their Daddy Mc Chik’n; a double plant-based ‘chicken’ on black buns, ‘cheddar cheese’, lettuce, tomato, fried onions and Daddy Sauce. 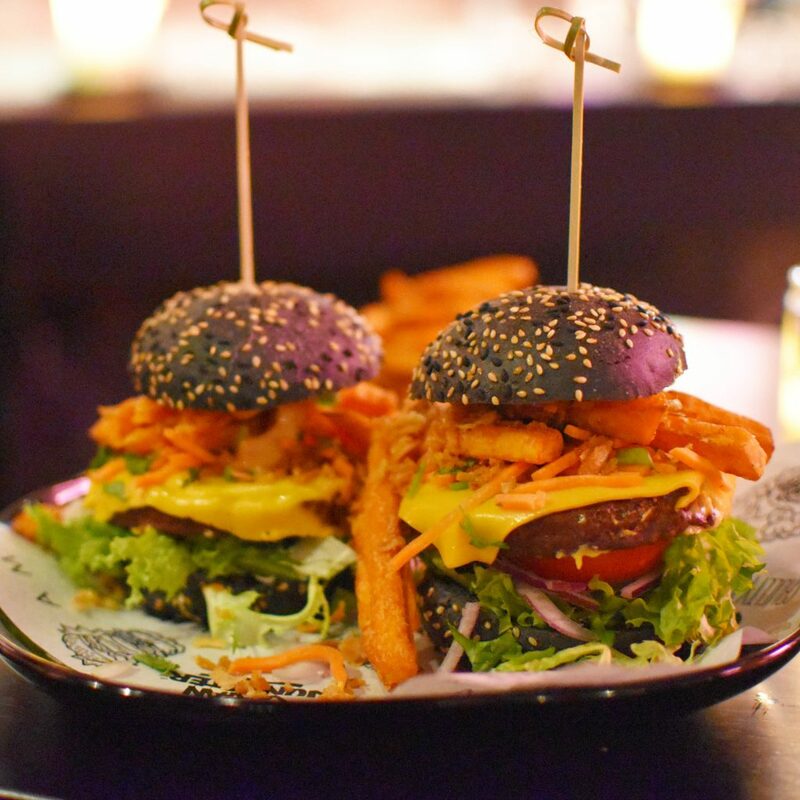 These two burgers pictured here are the ‘Fabulous Twinburgers’, double plant-based beef with hoisin sauce on black buns topped with sweet potato fries. I was really impressed by the vegan cheese. I wasn’t able to tell the difference with cheddar cheese. 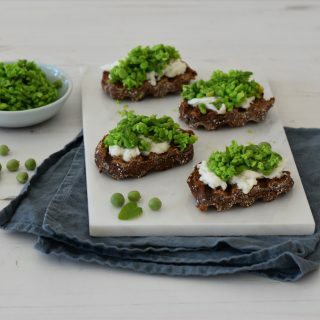 Vegan cheese often has a ‘nutty’ aftertaste or it’s just not really flavorful. The cheese at Vegan Junk Food Bar is definitely an exception. It was the best vegan cheese I’ve ever had! Fries lovers can order one of the sides like Truffle Fries, Waffle Fries and Sweet Potato Fries. They also have loaded fries that are big enough as a main dish. 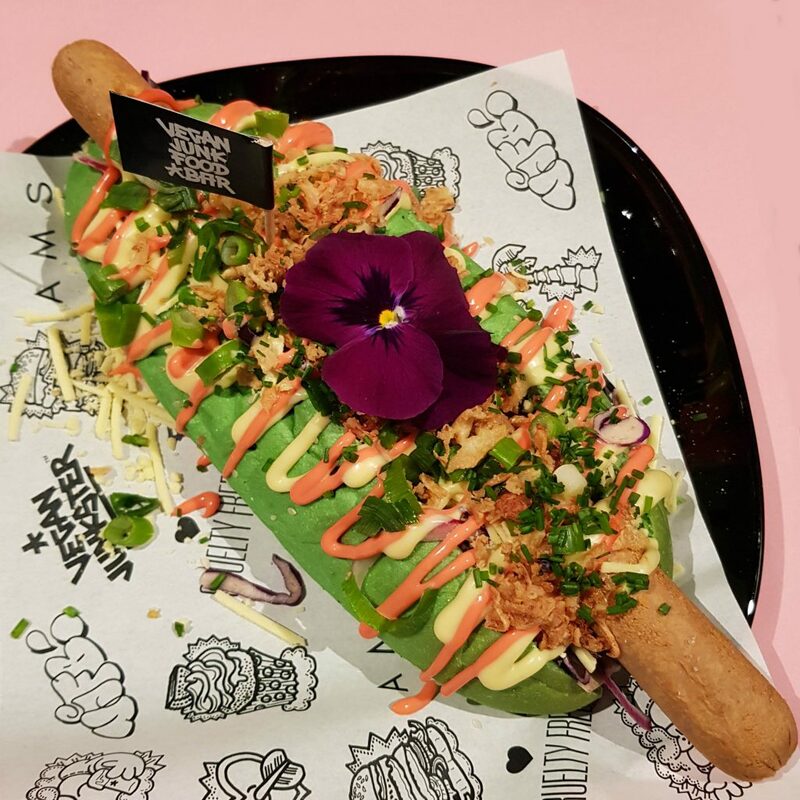 Try out their ‘vegan kapsalon’; loaded fries with vegan shawarma, grated ‘cheese’ and garlic sauce or the Fishy with seaweed nuggets (the latter is only available in VJFB De Pijp). What I also love about the Vegan Junk Food Bar in Amsterdam is that they have many colorful dishes. They have blue bread with pink dipping as a starter for example. Or check out this vegan hot-dog! This double hot-dog is served on a green bun with purple cabbage and pink aioli. That’s what I call ‘eat the rainbow’! 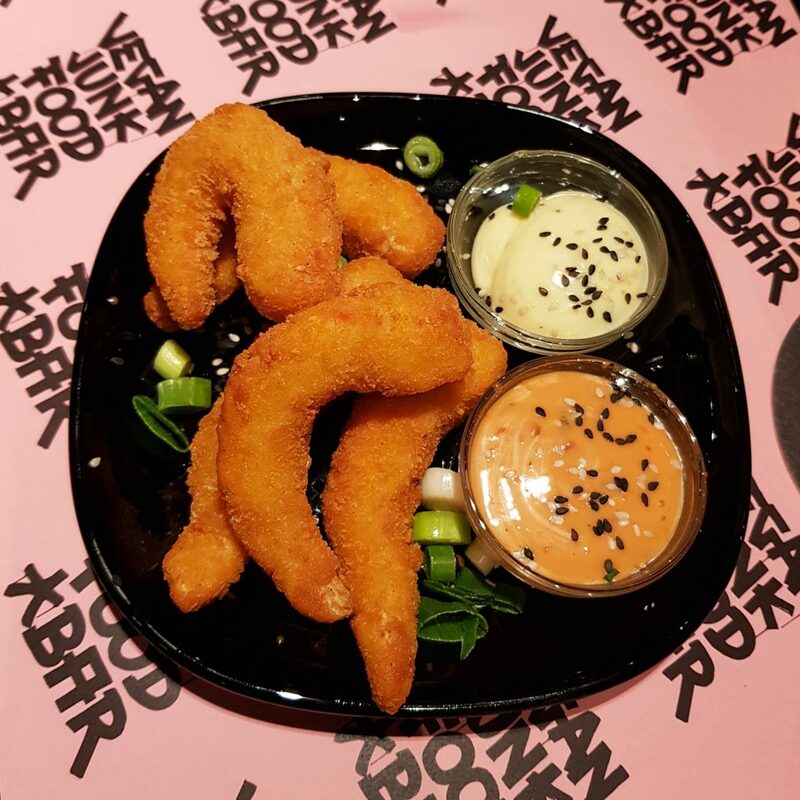 There are also several snacks on the menu, like a vegan version of the typical Dutch ‘bitterballen’ or these vegan shrimps. 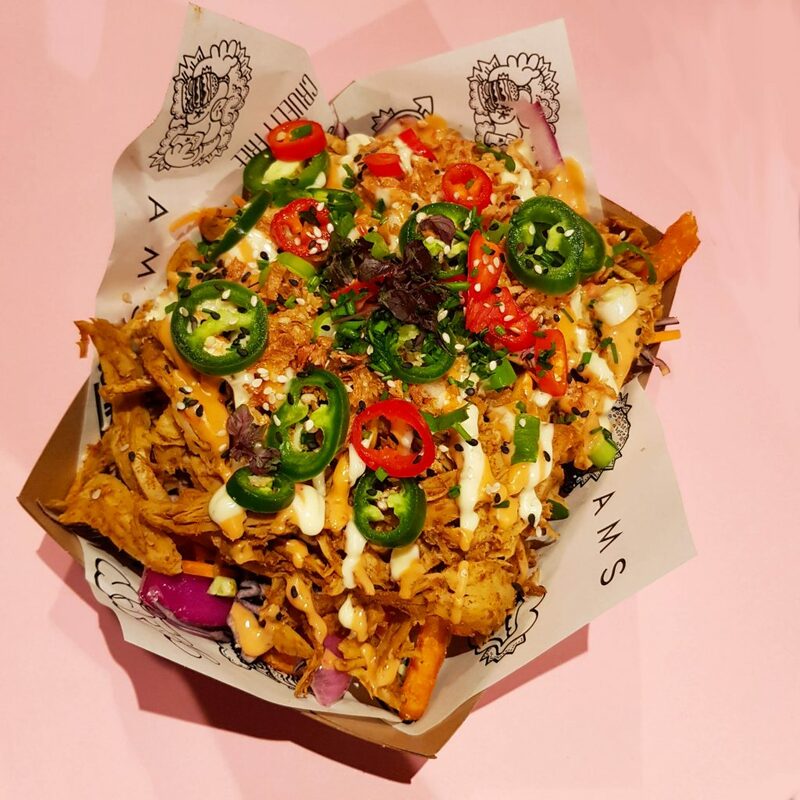 As the Vegan Junk Food Bar Downtown is located in a clubbing street, it makes a good stop for a late night snack after you’ve gone for a drink or a dance. 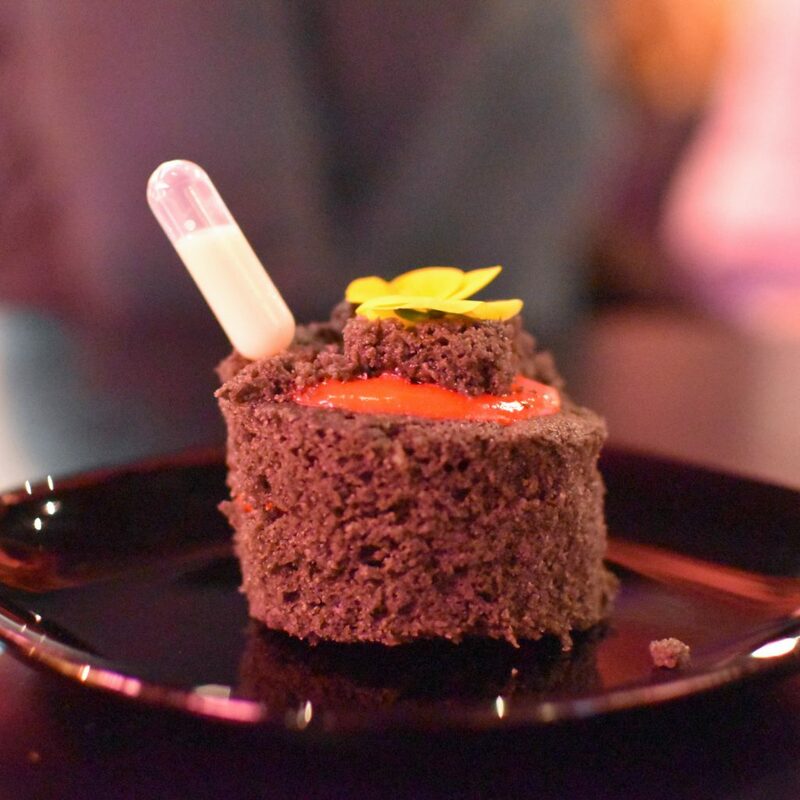 On the menu of the Vegan Junk Food Bar Downtown in the Reguliersdwarsstraat they also have this Vegan Baileys Black Velvet Cake on the menu and several Professor Grunschnabel ice cream tubs for dessert. 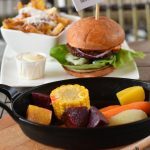 The vegan cake isn’t the best you’ve ever had, so no need to leave room for dessert; stack up on your loaded fries and vegan burgers instead! Want to satisfy your vegan sweet tooth? Click here for my recipe of Vegan Baileys Cheesecakes. Click here to visit the VJFB website or click here for all my Amsterdam food favorites. 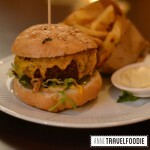 International Hamburger Day: veggie burgers fro ..